aniel Agger was a centre-back whose ability on the ball allowed Liverpool to build out from defence and made him a long-standing favourite on the Kop across almost nine years as a player at Anfield. Composed in possession, an assuring presence in any backline and with the natural power and athleticism to contain opposition forwards, the Dane was a perfect fit for English and Premier League football. After beginning his career with Brondby in the Danish Superliga, Agger caught the attention of Europe's top clubs and it was the Reds who succeeded in the race for his signature, which was sealed in January 2006. The classy left-footer made his Liverpool debut against Birmingham on February 1, though injury meant his first few months on Merseyside were spent largely on the sidelines. However, the 2006-07 campaign saw Agger force his way into the starting XI, and he even won PFA Player of the Month for September. A 35-yard belter against West Ham did his kudos no harm, with the strike winning the club's Goal of the Season prize. The highlight of his first full campaign came in the Champions League semi-final second leg against Chelsea, when his left-foot strike took the game to penalties. Agger went on to play 90 minutes in the final defeat by AC Milan. A metatarsal break left the popular defender on the sidelines for a large chunk of 2007-08 but there was some joy when Denmark's top players and managers voted him Player of the Year for the first time. Over the seasons that followed, Agger endured several more injuries that would disrupt his ability to help Liverpool's fortunes. But he did travel to his first major international tournament in 2010 - although, sadly, Denmark's World Cup was over at the group stage. 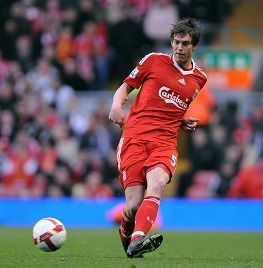 Back in domestic football, the Dane collected a medal with Liverpool in 2011-12. Much to the delight of the Kop, the campaign saw him become an almost permanent fixture on the teamsheet as he formed a strong partnership with Martin Skrtel and helped the club lift the Carling Cup. With Brendan Rodgers installed as manager, Agger then committed his long-term future to Anfield by signing a new deal in October 2012. Four months later, the defender reached 200 appearances for the Reds when he featured against Zenit St Petersburg in the Europa League. The good times continued when the boss appointed his No.5 vice-captain in August 2013 and the centre-back was involved in 20 matches as Liverpool so nearly scooped the Premier League title, ultimately finishing second. Agger notched in front of the Kop on the last day of the campaign, in what would prove to be his final Anfield appearance. For, as the summer transfer window neared a conclusion, it was announced that he had completed a return to his former club, Brondby, after 232 games for Liverpool.